Father and son duo Joe and Luke Slawek make their living adding flavor to almost every food imaginable. Now, they are spicing up the way they do business – using a new Vision Jet. Founded by Joe in 1987 when Luke was just six years old, FONA International, Inc. uses some of the best flavor scientists in the world to create and produce flavors. It didn’t take long for the business to become recognized as a world-flavor and market solutions leader. Soon, Joe realized they would need a better solution to keep up with client demand. He decided to take FONA to the skies, although aviation was no new venture for the Slawek family. 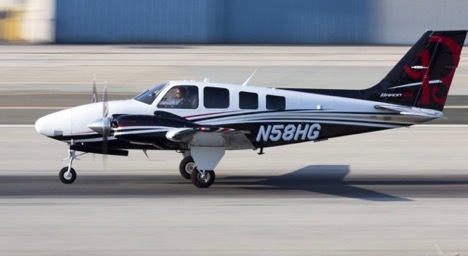 While Luke was in flight school at Embry-Riddle, Joe’s passion for flying renewed when he realized the ease of a quick father-son hunting trip with a personal aircraft on hand. “I think that is when we really understood what a time machine it is to have aircraft available,” said Joe. Joe began considering how to utilize aviation to improve the FONA business model. He realized that unhindered flight could be the most important asset. Joe and Luke began flying aircraft loaded with samples of FONA’s products around the country to potential clients in a Pilatus PC-12. Today, they estimate they have flown over 30 different airplanes together, falling in love with Cirrus and Beechcraft products. Lone Mountain has assisted in a few transactions for the Slaweks. It was instrumental in the international selling of a 2012 King Air B350i to a buyer in China before acquiring a new 2017 King Air 350i for the Slaweks. Aviation turned out to be a beneficial move for the FONA business model. Last year, Joe again enlisted the Lone Mountain team to help negotiate the purchase of a brand-new Cirrus Vision Jet. With an aircraft on hand, FONA is able to get products into the hands of customers on a very tight turnaround, and then get its employees back much faster. According to Joe, the shorter business trips allow FONA employees to have a steadier home life and pick up another day of productivity back in the office the following day. Thanks to the purchase of the Vision Jet, Luke has developed a great relationship with the Cirrus team through the delivery and training phases. Joe is currently working on his type-rating for the Vision Jet. “I have about 20 hours in it, and it is an exciting time,” said Joe. Not only do the Slawek men use their aircraft to take care of business, but they also make time to mix in pleasure. The aircraft have transported three generations of Slaweks (and their canine companions) to fun-filled destinations like the Grand Cayman Islands.